It seemed like a routine day for Trent Galusha. Patrolling northbound I-5 in his Incident Response Team truck late afternoon on Wednesday, March 16, he came across a vehicle stalled in the middle of the highway at 41st Street in Everett. But for the driver, Stephanie Black, it was anything but routine. In January, Stephanie was involved in a serious collision with an impaired driver that left her vehicle totaled and her nerves on edge whenever she's back in traffic. So stalling out in the middle of a busy freeway during rush hour? That's a nightmare. Lucky for Stephanie, Trent arrived just in time. "He literally saved my life," she said. Trent, an 8-year veteran of our IRT, activated his flashing lights and helped Stephanie get her vehicle to the shoulder and he then checked to make sure she was OK.
"She was hysterical, sobbing," he said. "She said she couldn't speak, she just really wanted to get home. I asked if she needed medical help and she said no, she just had stress-related problems with traffic. I reassured her that she'd be OK, that I would sit with her until we got her helped and she just grabbed ahold of me." In fact, that day was the first time Stephanie had been back on a major highway since her collision. "If it wasn't for his calm aid in helping me beyond the scope of his employment, I'm not exactly sure I would've been able to navigate the situation," she said. "The compassion and empathy he showed me was amazing." After about 15 minutes, Stephanie calmed down to the point where Trent felt OK assessing the vehicle. He called her insurance company but found that her tow only covered about 15 miles, not far enough to get her home. The vehicle had a problem with the alternator, but Trent felt if it could just get a new battery, Stephanie could at least get home. He charged the vehicle and guided her to the nearest service station, ensuring Stephanie was able to make it home. IRT’s Trent Galusha’s calm and compassion helped a distraught driver get through a scary situation on I-5 in Everett. "Any of us in IRT would've done the same thing," Trent said. "I just think about what if this was my parents or my wife or my kids? Every one of us on the team does this every day. We know we're ambassadors out here, and we want to treat people right and help them any way we can." We often refer to our IRT as our super heroes and this is a perfect example why. For them, they're just doing their job. Changing a tire. Giving a car a jump. Or just being a calming voice. But for the person they're helping, they can be so much more. And that's why we're so proud to have them in our agency. "I cannot express how grateful I truly am for his assistance," Stephanie said. "He truly went above and beyond for me. I was terrified to be left alone and he said that wouldn't happen. What an amazing employee." Redmond residents quickly noticed when Leary Way Northeast flickered into darkness. A well-traveled corridor, Leary requires light to ensure safe passage for drivers, bicyclists, and pedestrians alike. The cause? Copper wire theft. Even more unsettling, our maintenance crews installed the wiring following another theft just 24 hours earlier. 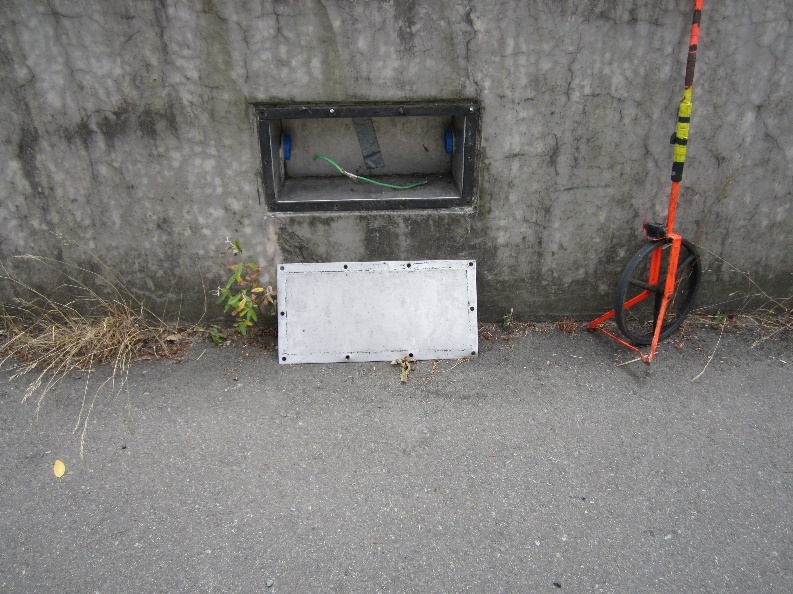 A junction box where wiring was stolen and the cover was forcefully removed. Despite fluctuating copper prices, our roadways have experienced a steady increase of copper wire theft over the past four years. Copper wiring plays an important role on Washington highways: it powers overhead signs, street lights, and traffic cameras. All important stuff! However, copper has historically been considered a lucrative material to steal and re-sell. Since mid-2015, we've replaced hundreds of thousands of dollars’ worth of copper in the Puget Sound region alone. Those are tax-payer dollars out of our maintenance budget that could go to repairing potholes, paving, cleaning trash, or other important work. Another junction box that has been tampered with and wire was stolen from. Copper wiring on major corridors lives in protected concrete “junction” boxes, which sit either in highway barriers or in the ground. Wire thieves go to great lengths to break into junction boxes and steal the wiring inside. Often, thieves will don fake construction gear to mimic the attire of a WSDOT worker, or place yellow flashing lights on their trucks. Thieves regularly destroy the boxes in order to infiltrate. Copper theft is a wasteful drain on tax-payer dollars. Breaking into a single junction box can put us at a $4,000-15,000 loss, depending on the thickness of wire stolen and damage to the box. Often, thieves will target multiple boxes a night. Wire theft also leads to unsafe traveling conditions. Without signals and lights, drivers can become confused or find it hard to see ahead of them. Without overhead signs to communicate about collisions ahead, drivers can’t effectively plan their routes. One of the WSDOT trucks we use for legitimate electrical maintenance. If you don’t see a WSDOT truck with logo on scene, please call 911. 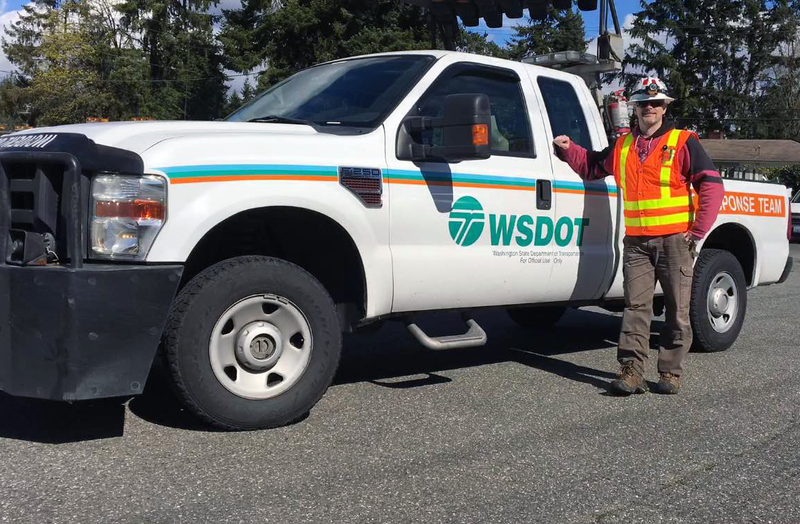 Look for the WSDOT logo – Thieves might be suited up in construction gear, but it’s unlikely their outfits or trucks will display our name or green logo. Is the crew working at night? – Our crews will never engage in electrical work in the dark. Because of the wiring’s high voltage, this sort of work is extremely dangerous in the dark. Watch for traffic control measures – Our crews will always have significant traffic control to alert drivers of maintenance work. Electrical repairs are never a single-truck job, and we use large, yellow vehicles. Our trucks have flashing signs and crews use a significant number of cones and barrels. Conversely, thieves will almost always have a single truck, and will try to appear as discreet as possible. Suspicious activity – Does something seem amiss, but you just can’t put your finger on it? Report suspicious activity just in case! How can you report suspicious activity? It’s easy! Washington State Patrol just needs a quick call to 911. An alert driver and a single phone call can benefit Washington highways for drivers, commuters, and tax-payers alike. 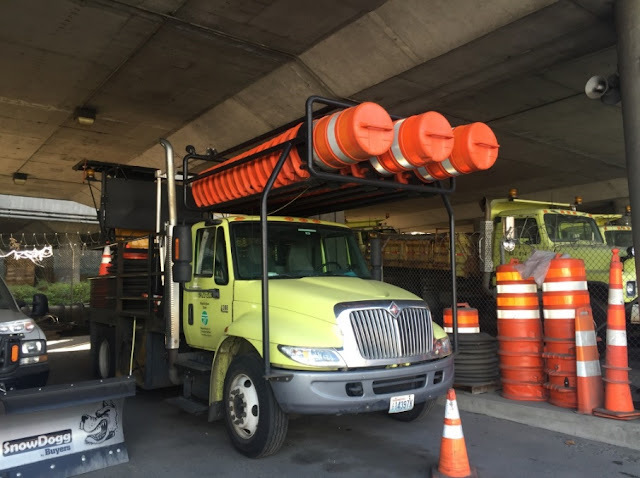 Sure, I’ll keep an eye out – but what is WSDOT doing? While you’re helping us out, we’re trying to up our game, too. We continue to use stronger theft protection on our boxes but have to balance that with the need to keep them accessible to our maintenance crews. In some locations, we are replacing copper wiring with aluminum wiring, which is a much less lucrative find for thieves. Combating wire theft is no easy task, but it’s a battle worth fighting. With your help, we can work to keep our equipment intact, our highways safe and important tax-payer dollars going towards needed repairs. Remember to call 911 to report suspicious activity! Maintaining our state highways is a team effort. In the Northwest Region alone we have more than 4,000 miles of highway and fewer than 550 WSDOT maintenance employees. We rely on you for comments and concerns about roadway safety. Whether you send us a tweet, a Facebook comment, email or make a phone call, we investigate these concerns and they often lead to us making a change or repair. That's what happened early Tuesday morning, March 22. A traveler reported a pothole on northbound Interstate 5 over South 288th Street in Federal Way. When our maintenance crews checked out the area, they realized the issue was with an area around an expansion joint. Three other expansion joints on the same bridge also needed some attention. To repair as much as possible all at once, crews closed the right three lanes and got to work chipping and repairing. It just took longer than expected. I work in our Traffic Management Center most mornings and see that the stretch of I-5 between Enchanted Parkway and Southcenter is almost always one of the first stretches of highway in our region to fill in during weekday morning commutes. We balance keeping your highways safe while limiting added delays to your commute. This work, while important for driver safety, didn't make the commute very easy, and we thank you for adjusting your routes and being patient. We still have some work to do on these bridge decks, so bridge crews will be out overnight this week finishing the work. Based on feedback we've gotten from you, northbound I-5 commuters, we'll be wrapping up work no later than 4:30 a.m.
Tuesday, March 22, to the morning of Wednesday, March 23 – Up to three right lanes of northbound I-5 after South 320th Street will be closed from 11 p.m. to 4:30 a.m. for expansion joint repair. 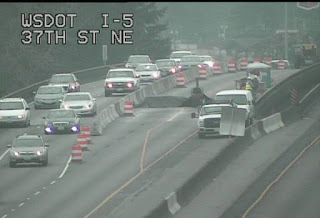 Wednesday, March 23, to the morning Friday, March 25 – Up to two left lanes of northbound I-5 after South 320th Street will be closed from 11 p.m. to 4:30 a.m. nightly for expansion joint repair. 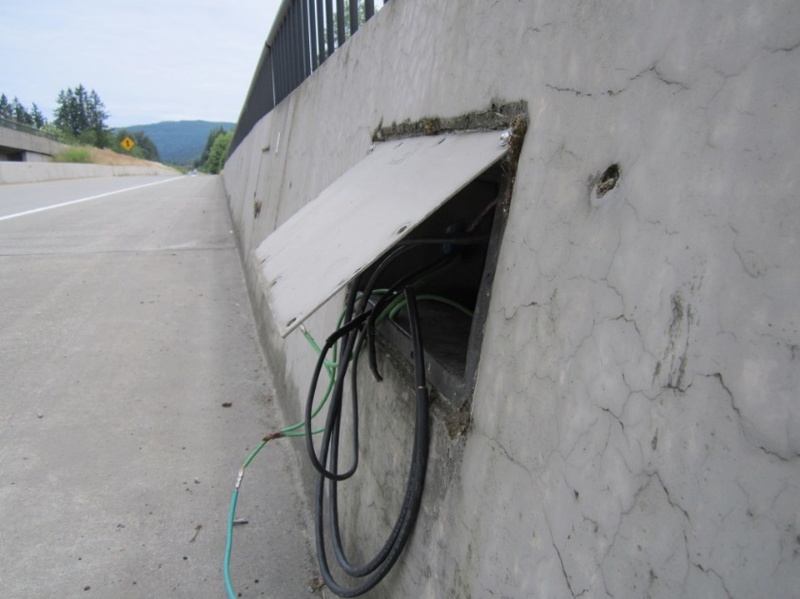 Next week we're also planning an expansion joint repair on northbound I-5 over South 272nd Street. So please, plan ahead and know before you go. 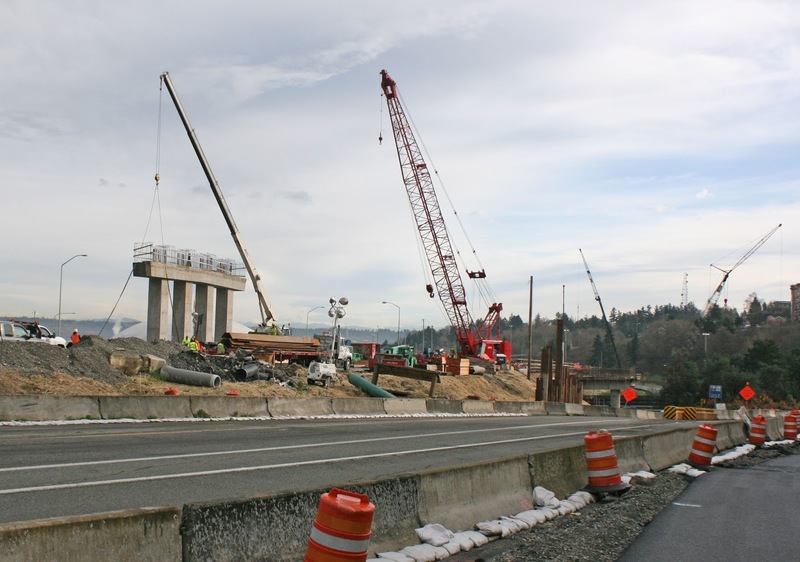 Check our Northwest Construction page and follow WSDOT Traffic Twitter for live updates during the morning and evening commutes. Your help keeping our highways safe is appreciated. If you have something to share, click here to find phone numbers and email addresses for our different departments or send us a DM on social media. Thanks again to those of you who take the time to share feedback on road conditions or other issues concerning your highways. 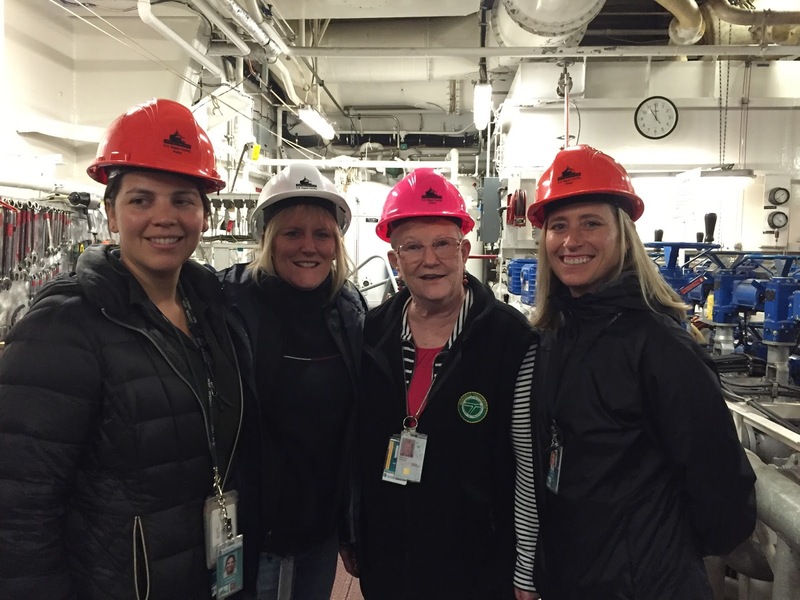 WSF's first all-female engine room crew, assembeled on the M/V Evergreen State. 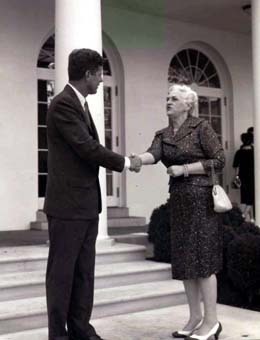 When Julia Butler Hansen oversaw the establishment of our state ferry system in 1951, one of Washington State's early female legislators may have had a hard time envisioning the system as it stands today. After all, back then women ferry workers were limited to cooking and cleaning aboard the ferries. The thought of women in the engine room? Way too strenuous. A female captain? Come on, now. A woman at the head of the entire system? Probably not. of our state ferry system in 1951. And yet, that's just where we are today. Women handle jobs throughout our ferry system, from loading cars to maintaining the engine, from steering the vessel to, yes, leading the entire Washington State Ferries system. But it hasn't been an easy road. In April, 1975 when Chief Mate Marsha Morse was hired as an ordinary seaman on the Fauntleroy/Vashon/Southworth route, state and federal laws had just been established requiring state agencies to increase employment opportunities for women, minorities and other protected classes. 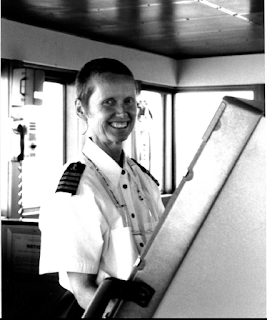 Morse, the third woman hired to work aboard a vessel, remembers she was not met with open arms. "Customers weren't used to seeing a woman on the car deck and some of them would shout at me, saying I was taking a man's job," she said. Female ferry workers stuck together, in 1980 establishing the "Women's Maritime Association," a support group for Seattle-based seafaring women that for two decades met to help ensure a productive working environment free from harassment. By the mid-1990s, women began to become part of the fabric of the organization, seizing opportunities and rising up through the WSF ranks. 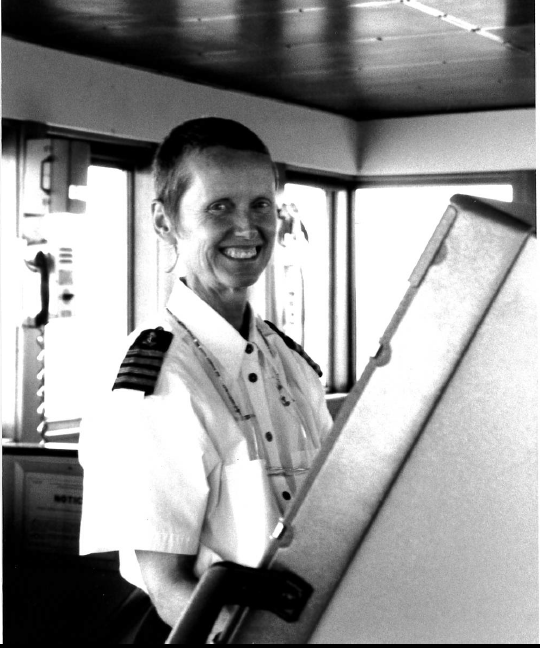 Beth Stowell started as an on-call deck hand in 1996, picking up shifts on all routes across the system. Today, she is WSF's first female Port Captain, overseeing all fleet personnel, vessel maintenance and repairs on the Vashon, Point Defiance and Port Townsend routes. beginning her career as the first woman Ordinary Seaman. Today WSF is home to 471female employees, including 15deck officers. Many of them, like Stowell, started as an ordinary seaman, the folks who clean the decks and helps load cars onto the ferry. And also like Stowell, many have worked their way up to leadership positions. The positions of Assistant Secretary of Transportation (Lynne Griffith), Chief of Staff (Elizabeth Kosa) and Director of Terminal Engineering (Nicole McIntosh) are all women. 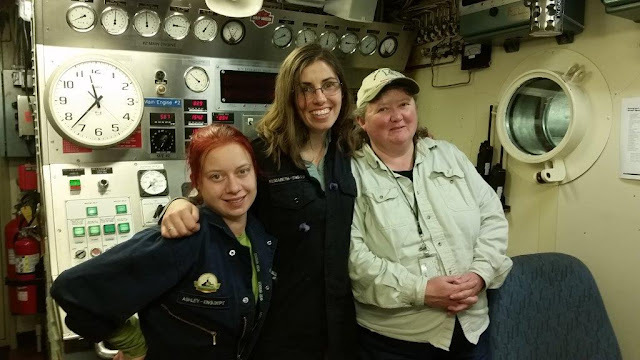 In 2014, WSF saw its first-ever all-female engine room crew when Chief Engineer Maureen McGarrity and oilers Ashley Hansen and Elizabeth Adams assembled on the M/V Evergreen State. While we've made strides in hiring women into positions across the ferry system, we have a long way to go to reach a level of gender, race, age and mobility diversity that mirrors Washington state. Want to help us bridge the gap? We've got some great career opportunities. Learn about open positions at WSF and come join us! 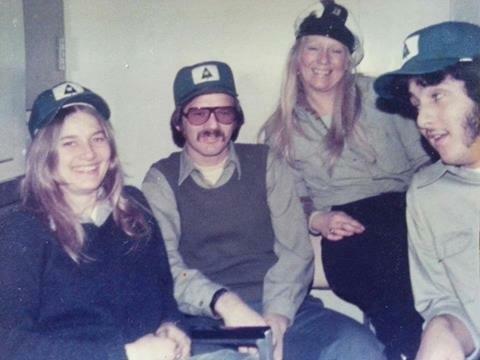 Marsha Morse (left), one of the first women to be hired to work aboard a vessel, with other Bremerton "B" watch crew waiting for the Bremerton ferry to arrive at Colman Dock in 1975. Note the old WSF logo on their hats. A busy weekend of roadwork is underway in King and Snohomish counties and we’ll be updating traffic conditions and work progress on this blog all weekend so be sure to check in regularly. The #SnoCoSqueeze on I-5 in Marysville will bring weekend backups and delays. Drivers should be prepared for lane reductions as well as reduced speed limits through the area. With southbound I-5 down to two lanes throughout the weekend, drivers should plan trips for earlier or later in the day or consider alternate routes or public transportation. 7:26 p.m.: The backup is only about a mile, just takes an extra minute or two. By tomorrow morning we'll three narrow lanes. 6:49 p.m.: Things improving rapidly now in Marysville. Backup is less than 2.5 miles; vehicles taking about 8 minutes to get through it. 6:10 p.m.: The backup is back down to 4 miles, which takes about 26 minutes to get through. 5:37 p.m.: The backup has grown again, reaching back to 116th Street, about 5 miles. 5:07 p.m.: It's taking about 24 minutes to get through about four miles of backup, which starts at about the outlet mall. 4:14 p.m.: For the Monday AM commute SB I-5 will have three narrow lanes shift to the right. 2:58 p.m.: Backup is now more than 4 miles to the outlet mall. Vehicles are taking about 20 minutes to get through the backup. 206 p.m. Backup is now about 3 3/4 miles to Tulalip Casino. Vehicles are taking about 18 minutes to get through the backup. 12:47 p.m.: Backup now 3 miles to 88th St NE. Vehicles are taking about 12 minutes to get through backup. 11:55 a.m.: Backup slowly growing -- now more than 2 miles before SR 528. Timed a vehicle at 10 minutes from start of backup to end of work zone. 11 a.m.: Contractor crews have tented new expansion joints as concrete cures in case of rain. 10:35 a.m.: Collision in work zone cleared to the left. One-mile backup to SR 528. We tracked a vehicle through the backup and it took about 5 minutes for it to get through. 10:32 a.m.: There is a collision blocking the left lane within the work zone. Expect delays to increase. 10:20 a.m.: Volume is starting to increase through the work zone, but delays remain minimal so far. 8:40 a.m.: Travel times along southbound I-5 from Marysville to Everett remain near normal with no backup through the work zone. Crews are pouring concrete around new expansion joints installed overnight and that concrete will be curing throughout much of the day Sunday. Summary: Backups began around 8:30 a.m. and reached their peak at 4 p.m., when congestion extended for about 5 miles to 116th St. NE. Backups slowly began to decrease into the evening, and are currently less than 3 miles, beginning south of 88th St. NE. Work is on-schedule for concrete pouring to take place in the morning. Thanks for staying engaged and remember to continue proactively planning your trip. 6:30 p.m.: Backup slowly decreasing -- now around 4 miles beginning in front of Tulalip Rsort Casino. Meanwhile on SR 9, southbound congestion through Marysville has cleared. 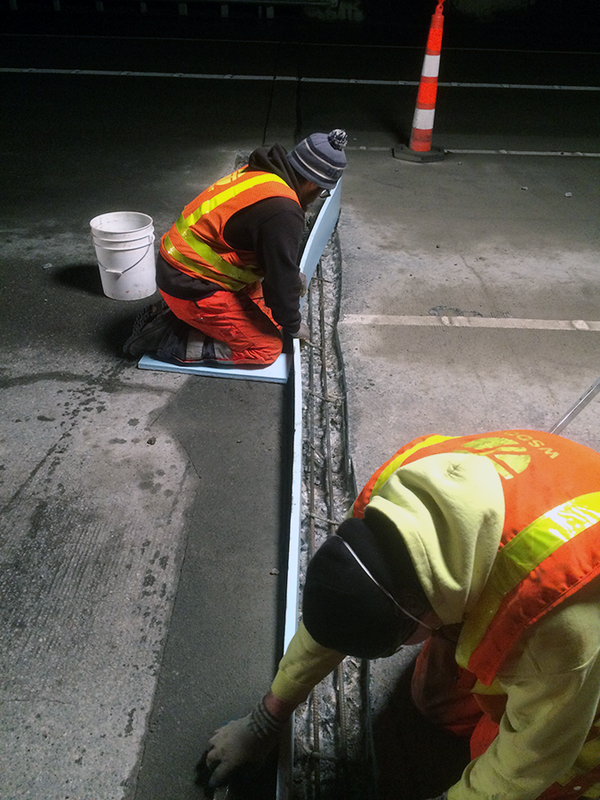 Contractor crews are pretty much done removing old expansion joints and will set and form new joints overnight. 4:32 p.m.: Drivers seeking to avoid I-5 congestion by taking southbound SR 9 will find a 1 mile backup. WSDOT signals engineers are en route to try and improve flow given heavier traffic. 4:19 p.m.: Travel time from beginning to backup to end is currently about 17 minutes. 3:32 p.m.: Backup is now about 4.5 miles, extending to a point just before 116th St. NE. 2:41 p.m.: Travel time through the construction zone remain at about 9 minutes; the backup is currently 3.2 miles. 2:37 p.m.: Tracked a car from 88th St. NE to 37th St. NE. The journey through the construction zone only took 9 minutes, shaving 2 minutes off last hour's journey. Continue staying engaged and planning your journey so we can keep travel times as manageable as possible! 1:23 p.m.: Tracked another vehicle on our cameras from 88th St. NE through the construction zone and through the 2.5 mile backup it took 11 minutes. 12:56 p.m.: Backups start just after 88th St NE and stretch about 2.5 miles on SB I-5 through the work zone. 12:00 p.m. Tracked a semi from start to end through the construction zone, and it took them about 5 minutes to get through the 2 mile stretch. 10:46 a.m.: Chipping the expansion joint takes a lot of work! 8:20 a.m.: Traffic is beginning to slow southbound I-5 through the construction zone. Posted speed limit is 45 mph. 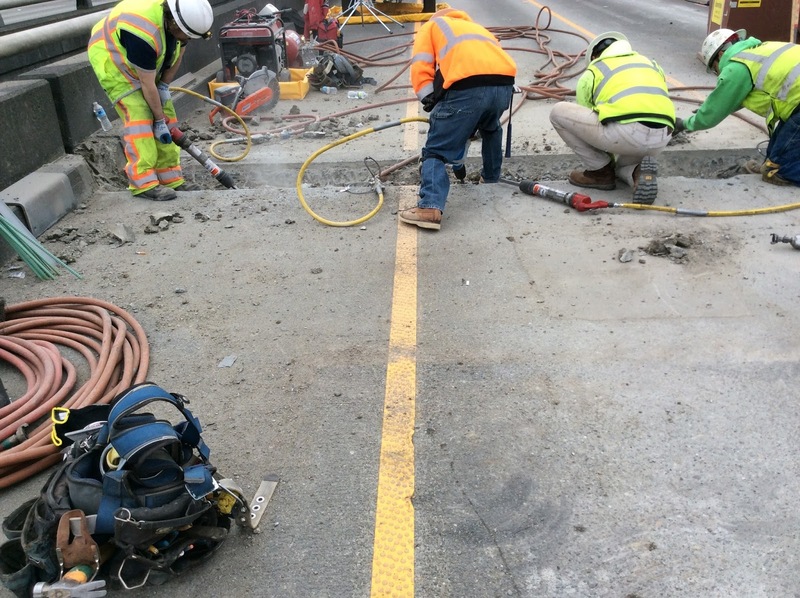 In King County, be ready for re-striping work on northbound I-405 at the SR 520 interchange as part of a project to improve traffic flow and access in that area. Expect multiple lane and ramp closures overnight so plan ahead for delays or consider using alternate routes. Finally, don’t forget that Friday at 7 p.m. marks a change to our I-405 express toll lane system. All drivers – even without a Good to Go pass – will be free to use all lanes on weekends, from 7 p.m. to 5 a.m. on weeknights, and on some holidays. We encourage drivers to stay engaged and plan ahead. Plan for longer than normal travel times, adjust your travel times or routes when possible and consider carpooling or public transportation. Follow @wsdot_traffic on Twitter and search #SnoCoSqueeze for updates. Check the Marysville-area and Seattle-area traffic pages. Get the WSDOT mobile app. We are always looking for ways to minimize the traffic disruption that comes with maintenance work. I saw it first hand when our signals team had routine maintenance to do on those overhead signs along Interstate 90 – you know, the ones that display the speed limits for each lane that can change to a red X if there is a crash – we call them Active Traffic Management Signs (ATMS). Normally to do maintenance on these signs, we close down the entire interstate for several hours so crews can go up in bucket trucks and work on all the signs along a stretch of highway. This time, they tried a new method to keep the highway open for those travelling along I-90 late Saturday night and early Sunday morning. Instead of a full closure, they used rolling slowdowns and closed a max of three lanes, leaving at least one lane open for traffic. Now you may think that this would be the obvious choice, but this new method made some folks – especially the superintendent of the road crew – more than a little nervous. That's because instead of having a closed road where his crew was working, there was still traffic driving by at reduced but high speeds. The safety risk obviously goes up. Traffic control in place for Active Traffic Management Sign work on I-90. Creating a safe operation while still opening the road to drivers took a team effort. There were 11 rigs that were part of this operation plus two Washington State Patrol troopers. We had two bucket trucks, four dump trucks with attenuator cushions, two road warrior trucks stacked with traffic cones and barrels and three arrow board pick-ups. The first step was a team meeting at the WSDOT shop in South Seattle. There, the operation leader made sure that everyone understood the exact work locations, spacing of the trucks and how we'd coordinate movement from one maintenance site to the next. Questions were asked and clarified, and then the team suited up into their reflective gear and other personal protection equipment and lined up their rigs. The operation moved like a well-oiled machine as we headed to eastbound I-90. We turned around at the roundabout on West Lake Sammamish and started moving westbound to our starting point. You can see a bit of the formation in the photo below. The first warning to drivers was a portable LED sign before the first maintenance zone letting them know about road work ahead. After that is when the trucks and teamwork came into play. It started with an attenuator dump truck blocking the HOV lane with a flashing arrow moving traffic to the right. Then another truck pushed traffic out of the left general purpose lane. Eventually a truck pushed traffic into the right general purpose lane. You can see the final two large trucks (a road warrior on the left of your screen an attenuator truck on the right) were situated as buffer several hundred feet before the bucket trucks, where two workers were harnessed in and were the flyers for the evening. 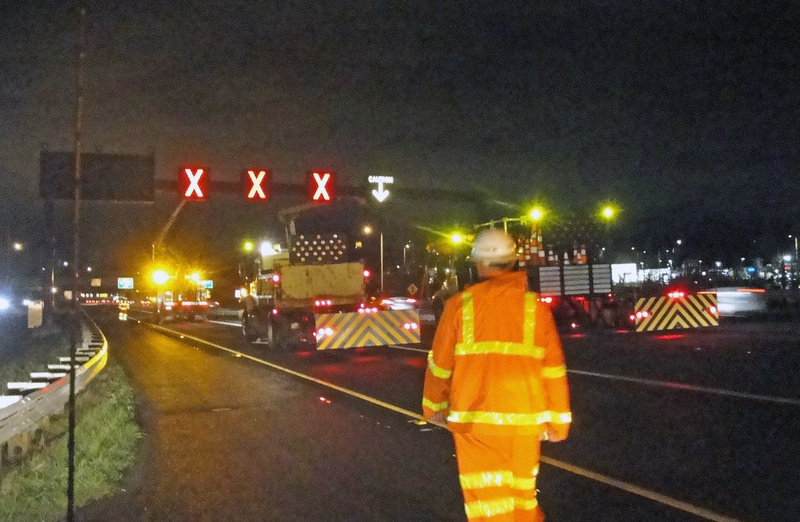 Our crews use teamwork and a combination of vehicles and lighted signs to keep the work zone protected. Using this technique, trucks and crews played the role of very visible traffic control devices, gradually tapering lanes closed from a driver's left to right. 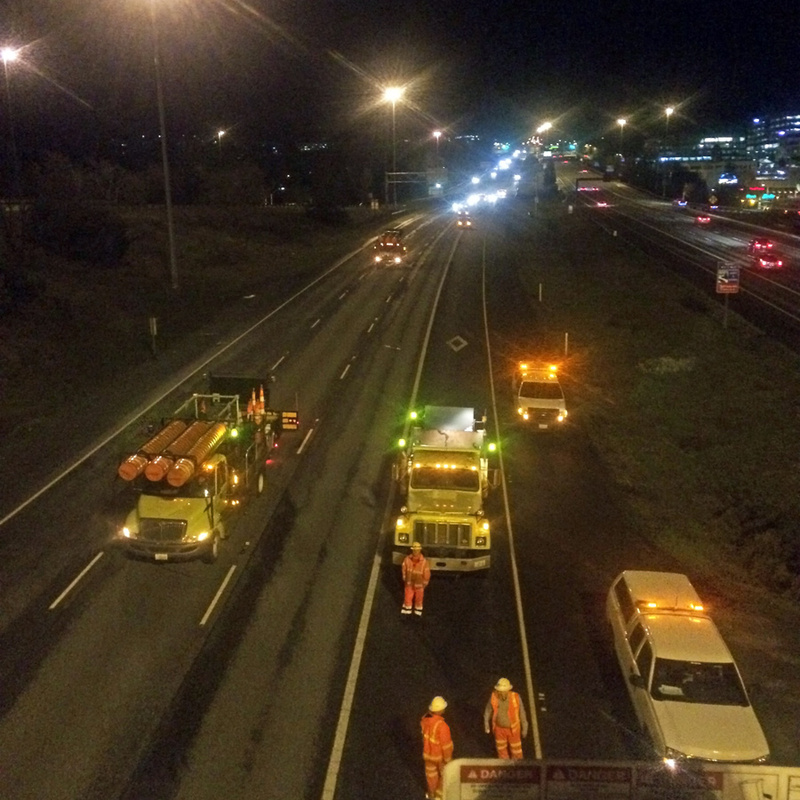 We did this instead of dropping barrels so that as soon as crews finished work on one ATMS we could roll the operation forward to the next one – maintaining that safe zone for workers but keeping the lane reduction area condensed to keep traffic moving. Overall this new closure method was a success. Most drivers respected the work zone, slowed down and moved right when they first started to see flashing signs. Those who didn't were greeted in person by one of the two WSP troopers supporting the work zone. We want to do our best to keep the traveling public moving but our first priority is the safety of our crews and those of you traveling near the work zone. Oh, and in case you were wondering what we were doing out there...we were changing air filters. Just like the ones in your house and your car, they need to be changed regularly to keep the electronics in these signs operating correctly – and boy do they get dirty! With all the dust, wind and exhaust that blow through I-90, they turn from white to black in less than a year. What the ATM filters look like when they are new and after a year of use. Thank you to everyone who drove past us who slowed down and merged right. You helped create a safe work zone while we tried out a new way to do maintenance on these signs. 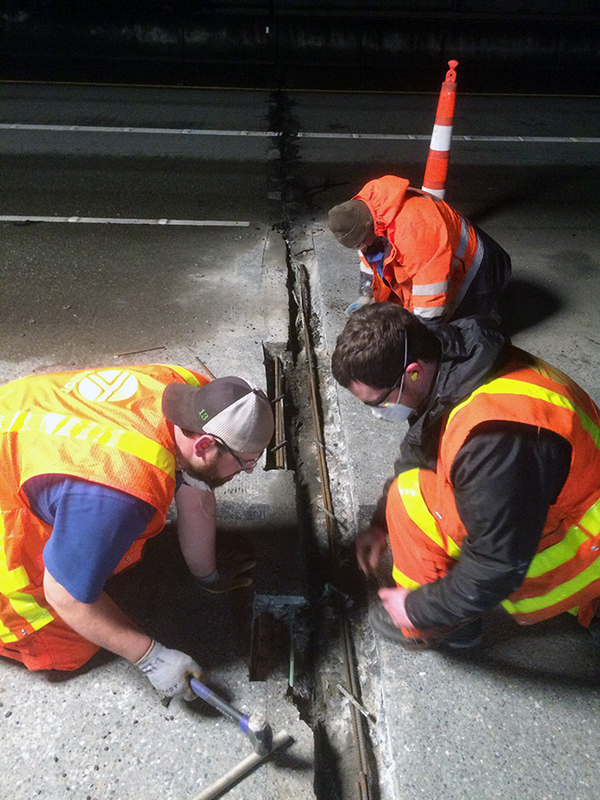 Our crews will be out again starting at 11 p.m. on Saturday, March 19, until 5:00 a.m. on Sunday, March 20 – this time on a stretch of SR 520 both directions between mileposts 5 and 8 – using this rolling slowdown method again. Thank you in advance for using caution around them. If you drive northbound on I-405 often, chances are you’ve run into traffic at the northbound I-405/SR 520 interchange, where drivers from both highways converge and traffic can back up. We’ve heard about it from drivers, and we’ve seen it ourselves. You’re frustrated and we want to fix it. We’ve been looking for opportunities to improve traffic flow at this critical interchange. With the express toll lanes now open, we’ve had the chance to monitor traffic patterns and create plans that respond to drivers’ choices. Many drivers entering the express toll lanes at SR 520 are coming from downtown Bellevue. 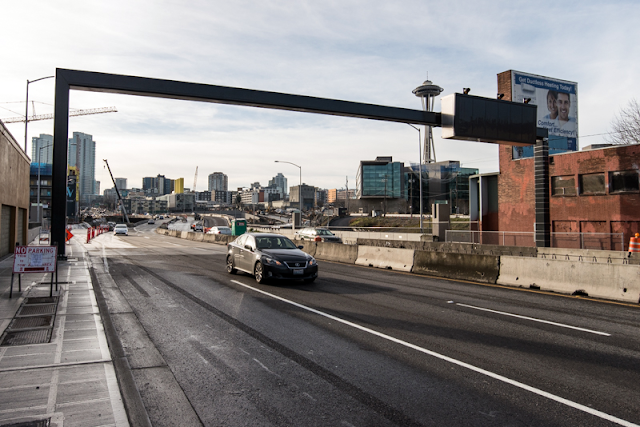 While Northeast 6th Street provides a direct access into the express toll lanes from downtown, we are seeing that people are not always choosing this new option and instead they’re using the SR 520 access from Northeast 4th Street and Northeast 8th Street ramps. But as the name indicates, the SR 520 access point occurs right near the on-ramp from SR 520, meaning that a lot of cars are converging at the same point on the highway, creating the bottleneck. Our goal is to open up this chokepoint, allowing more space for cars to flow. To do that, we need to get cars into the express toll lanes earlier and give vehicles from SR 520 more time and room to safely and easily merge onto the highway. Our plan to improve traffic flow has two components. First, crews will extend the SR 520 to northbound I-405 on-ramp by a half mile to give drivers more room and time to merge into the I-405 general purpose lanes. Second, crews will triple the length of the express toll lane access point at SR 520, extending it southward, allowing drivers from downtown Bellevue earlier access into the express toll lanes. That means the access point will change from a weave lane to a skip stripe type of access. 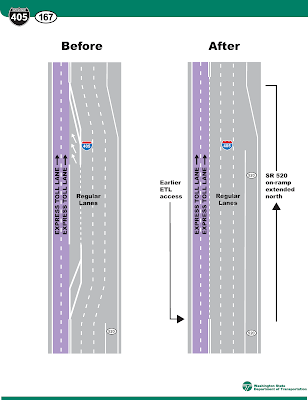 As you can see in the before and after diagrams, a weave lane has striping that acts like a cushion, allowing drivers space to merge in and out of the express toll lanes without holding up the drivers behind them. 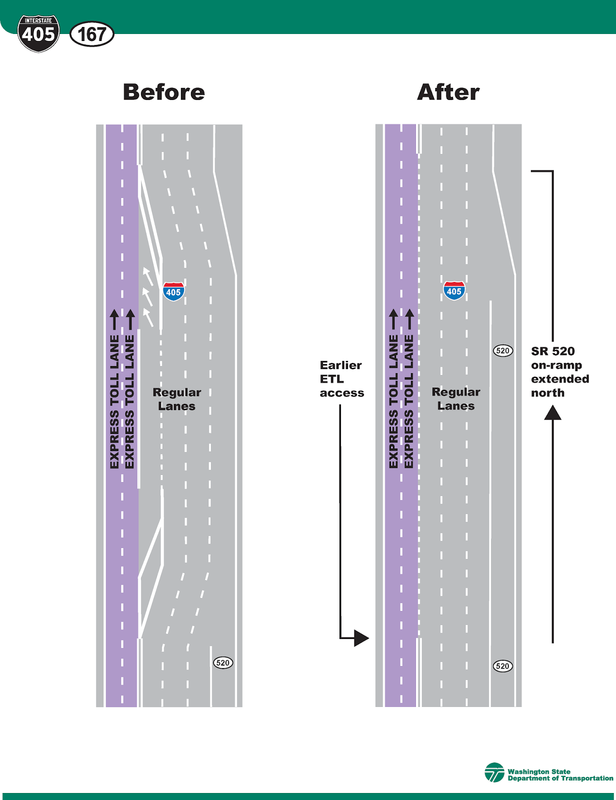 A skip stripe is made of simple dashed lines that indicate it’s OK to enter and exit the express toll lanes. A longer skip stripe provides more access and more opportunity to find a gap in traffic when moving from slower to faster speeds. 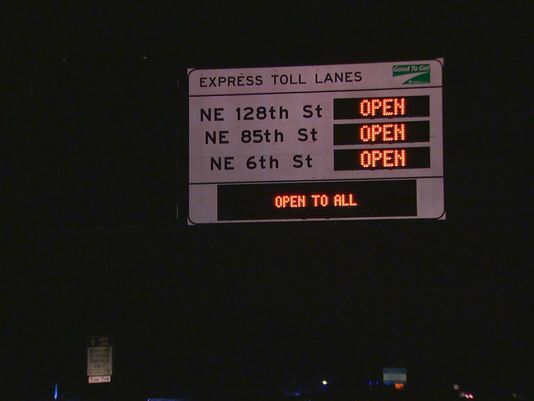 These changes will allow drivers to access the express toll lanes sooner from Northeast 4th Street and Northeast 8th Street in downtown Bellevue. By the time express toll lane users reach SR 520, they’ll be out of the general purpose lanes, providing more space for the drivers entering I-405 from SR 520. 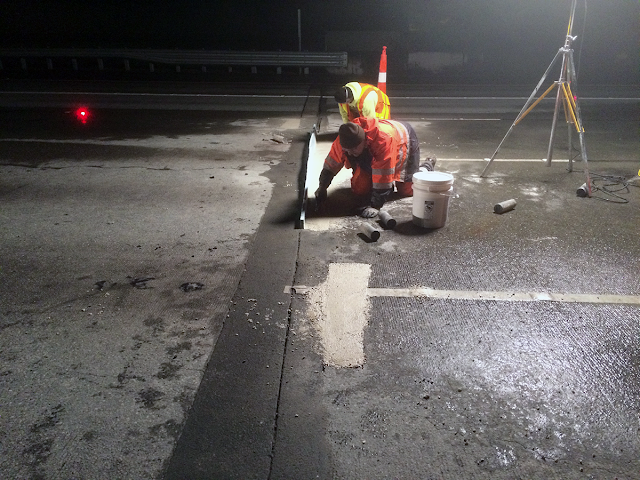 This work is weather dependent and requires two nights of favorable weather conditions to complete the lane striping. Signed detours will be in place. Keep in mind that it may take drivers awhile to get used to the new striping. So be alert when you’re driving through the area as the road will look a little different. And remember, the bottleneck won’t disappear overnight; drivers will need time to adjust to the new configuration. In case you love to access the express toll lanes via the Northeast 6th Street Direct Access ramp, don’t worry, the ramp won’t be affected by this work. We’ve made changes along I-405 based on driver feedback and we’re looking forward to continuing the trend. So drop us a line. What other changes might help traffic flow? We’d love to continue the conversation. Starting on Friday, March 18, the I-405 express toll lanes will no longer operate 24/7/365. 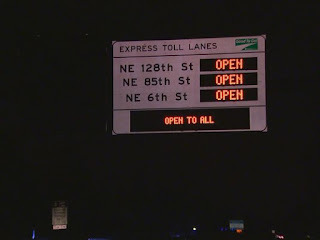 That’s right, we’re shutting off the tolls at 7 p.m., and opening the lanes to all traffic all night (and weekend) long until Monday morning at 5 a.m.
For the past two months, we’ve been working with the Governor, the legislature, and the Washington State Transportation Commission, on a plan to change the I-405 express toll lanes hours of operations. On Tuesday, March 15, the Commission and WSDOT announced the express toll lanes will be free on nights from 7 p.m. to 5 a.m., weekends, and six major holidays (for those doing the math: New Year’s Day, Memorial Day, Independence Day, Labor Day, Thanksgiving, and Christmas). Since we launched the express toll lanes last September, regional drivers have made millions of trips in the express toll lanes, showing us just how much they value reliability during the weekday commute. However, we’ve also heard many concerns from drivers, including asking for the express toll lanes to be free during periods of low traffic like nights and weekends. After nearly six months of monitoring and analyzing traffic patterns, we feel the new hours of operations will still allow us to provide a faster, more predictable trip to transit, carpools and toll-paying customers when they need it most, while balancing traffic across all lanes during off-peak travel. What do drivers need to know? Check the signs. The signs will display the words “Open to All”. That means drivers can enter the lanes for free without a Good To Go! pass or a carpool. Use the designated access points. Drivers must observe the designated access points, and are not permitted to cross the double white lines at any time. Failure to observe these rules may result in a $136 ticket. WSDOT designed an express toll lanes interactive map to help drivers learn the access points and plan trips. Direct access ramps are HOV only during off-hours. Only transit and two-person carpools are permitted to use the direct access ramps at NE 6th Street in downtown Bellevue and NE 128th Street in Totem Lake. These signs will show HOV2+ NO PASS NEEDED. This means there will be limited exits for drivers traveling southbound through Kirkland and downtown Bellevue due to the restrictions at these two locations. WSDOT is looking at options to improve access in these areas. During weekdays, drivers will still have the option to pay a toll to use these ramps. Other tolled facilities operate as usual. The SR 167 HOT Lanes and SR 520 and Tacoma Narrows bridges will operate as usual. Improved algorithms to keep the toll lanes moving. And finally, we anticipate Good To Go! customer service call volumes may increase with this and coming changes, so we encourage drivers to first look for information online at GoodToGo405.org and pay toll bills and set up accounts using MyGoodToGo.com. We ask drivers to be patient as we continue to improve the operation of these lanes, and please continue to send us your feedback. Looking north from Pacific Avenue across I-5 to downtown Tacoma. 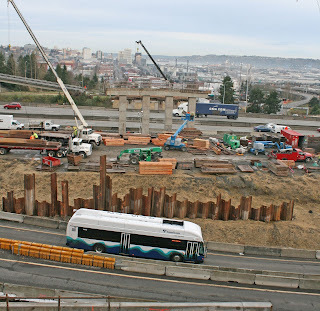 The sheet piling wall just behind the bus marks the north end of the final bridge pier to be built for the new Pacific Avenue overpass. Another sheet piling wall will be built where the orange-colored attenuators are. The area where the bus is will be excavated down 20 feet for the new bridge pier, which is why traffic has to be diverted. Rain - it is what makes the grass, moss and trees grow. But when it comes to paving and striping in roadway construction projects, rain can be a problem. Since December, contractor crews working on WSDOT’s I-5 - M Street to Portland Avenue HOV project in Tacoma have waited for a dry weekend so they could pave and paint new exit lanes from the northbound I-5 collector-distributor to Interstate 705 and State Route 7. 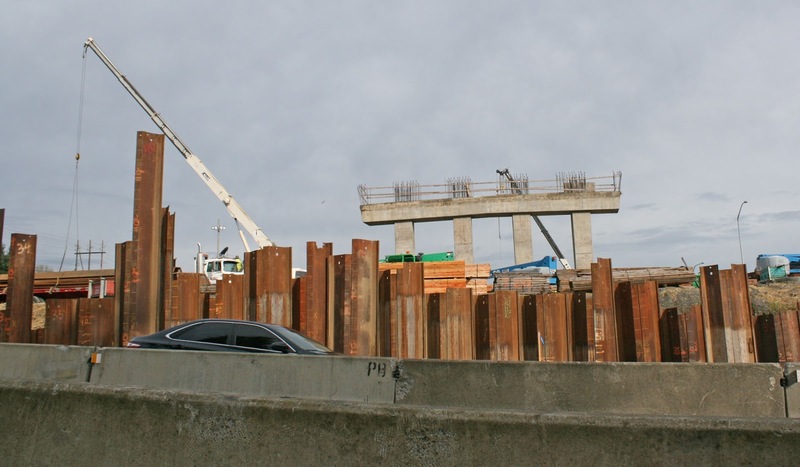 That work will allow them to shift traffic and start building the last of six bridge piers for the new Pacific Avenue overpass. The location of the bridge pier is within the current northbound I-5 exit to I-705. Crews need to excavate approximately 20 feet in depth where the current exit exists to build the pier. Before that can happen, the exit lanes to I-705 and SR 7 have to be shifted. Sounds easy, right? 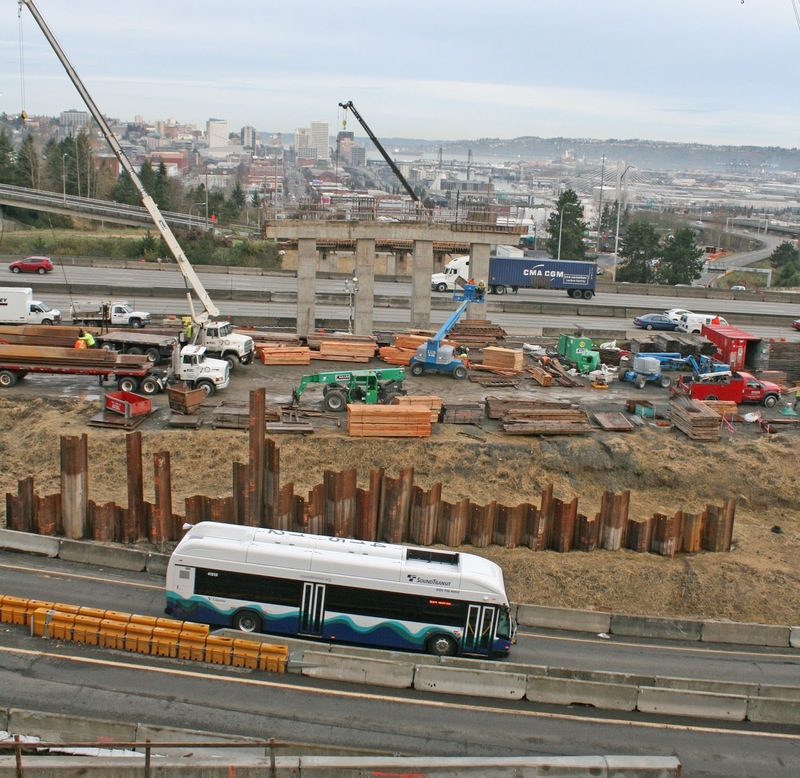 This sheet piling wall marks the location of the final bridge pier waiting to be built for the new Pacific Avenue overpass in Tacoma. To complete the traffic shift, crews will pave approximately 1,000 tons of new asphalt and paint lane stripes. This work requires a full weekend closure of the I-5 ramps to northbound I-705 and southbound SR 7 at the City Center exit. The work also requires dry weather. It is nearly impossible to stripe a wet roadway. For nearly 15 weeks in a row, WSDOT has had to postpone this work because the rain just wouldn’t stop. The weekend of March 18, however, crews may finally get their chance. The pot of gold at the end of this rainbow is dry weather, and that’s what crews are hoping for. Contractor crews working for WSDOT will soon shift traffic to the right on the northbound I-5 exit to I-705 and SR 7 ramps. 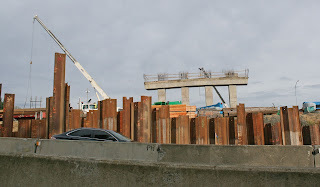 The traffic shift is necessary so crews can build the final bridge pier for the new Pacific Avenue overpass in Tacoma. Once the work is finished, crews can begin building the sixth and final bridge pier for the new Pacific Avenue overpass. WSDOT demolished the previous overpass in spring 2015 because the old piers were in the way of new lanes on I-5. The initial goal was to have the new overpass opened this month. As you can see, we are several weeks behind due to - you guessed it - rain. Once the final bridge pier is built, work to install bridge girders can take place, rain or shine. Final paving and striping on the new Pacific Avenue overpass is still months away and hopefully in drier weather. We appreciate everyone’s patience as we continue to safely build HOV lanes through Tacoma. For the latest weekend and possible rare daytime ramp closure information, please visit the www.tacomatraffic.com webpage. The Washington State Department of Transportation reopened State Route 520 floating bridge just before 2 a.m. after bridge maintenance crews repaired damage to the mechanical system caused by high winds. The Washington State Department of Transportation and the Washington State Patrol closed the State Route 520 floating bridge at 2:30 p.m. Sunday after waves generated by high winds began to wash across the bridge deck. Once closed, WSDOT bridge maintenance crews inspected the bridge and discovered damage to a portion of the bridge's mechanical system that allows the draw span to move up and down. WSDOT bridge engineers believe high winds contributed to the damage. The bridge remains structurally sound. The new SR 520 floating bridge is scheduled to open this spring. WSDOT will keep the bridge closed overnight to allow crews to make repairs to the mechanical systems. Crews expect the bridge to be open in time for the morning commute. A strong wind storm is battering Western Washington. The National Weather Service in Seattle expects the strongest winds to persist into Sunday evening then diminish overnight. Please be safe and use extra caution if you have to travel. Keep both hands on the wheel, especially if you drive a large vehicle. The same storm is forecast to dump several feet of snow in the Cascades, especially near Mount Baker and Mount Rainier. If you must travel, be sure you and your vehicle are prepared and stay updated on conditions by tuning in to media broadcasts and checking our travel alerts page. Here are the active closures as of 5:30 p.m. March 13. Updates to active closures will continue throughout the storm and will be labeled "UPDATE" with a time and date. When a road reopens or situation is cleared, that will be indicated with "REOPENED," or "CLEARED." REOPENED 2:25 a.m. -- SR 520 floating bridge: Both directions of SR 520 (MP 3) are closed due to high winds. Vehicles stuck on bridge have been cleared. Eastbound is closed at Montlake Boulevard in Seattle and westbound at 92nd Avenue Northeast in Bellevue. REOPENED 7:20 p.m. -- I-405 Alderwood: Southbound I-405 before SR 527 (MP 30), fallen tree(s) are blocking three right lanes. CLEARED 7:14 a.m. March 14 -- SR 542 Glacier: SR 542/Mount Baker Highway is closed from Glacier to the Mount Baker Ski Area due to fallen trees. CLEARED 6 p.m. March 13 -- SR 161 Graham: Southbound SR 161 near 194th Street East (MP 20) is closed due to downed power lines. Southbound traffic is being diverted into one of the northbound lanes. REOPENED 6:45 p.m. March 13 -- SR 104 Hood Canal Bridge: Both directions of SR 104 (MP 15) are closed because the drawspan has been opened to relieve pressure from high winds. CLEARED 5:42 p.m. March 13 -- US 101 Sequim: Southbound US 101 near Canal View Street (MP 311) is closed due to downed trees. CLEARED 7:58 p.m. March 13 -- US 101 Kalaloch: Both directions of US 101 near Olympic National Park Road (MP 161) due to downed trees. CLEARED 7:32 p.m. March 13 -- SR 20 Chimacum: Eastbound and westbound SR 20 is alternating near near Anderson Lake Road (MP 3) due to downed trees. Check this blog often, as we'll be updating it regularly with closure information. Since mid-January, crews have been drilling, pouring and constructing concrete foundations for four new overhead traffic signs on SR 99/Aurora Avenue North in Seattle. Located between the Aurora Bridge and just north of Mercer Street, these real-time traffic signs will communicate important information to drivers approaching the future SR 99 tunnel – similar to the large electronic signs on I-5 and other highways. Workers completed installing sign foundations that will eventually hold signs like this on SR 99 in Seattle. We're happy to report that this work went more quickly than expected. Crews were able to complete foundation work more than a week early and as Tuesday morning, the around-the-clock closures near Comstock Street have been completed. 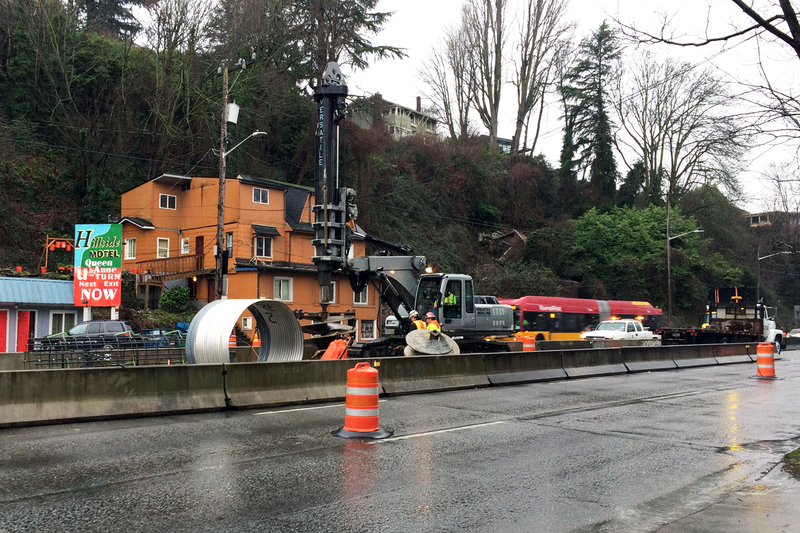 Placed approximately 1,700 feet of temporary concrete barrier to establish five separate work zones between the Aurora Bridge and Highland Drive. Cut and removed approximately 1,800 square feet of pavement and 800 feet of existing concrete barrier to make room for the new foundations. Drilled five underground shafts for the sign foundations. Each shaft is 4½ feet in diameter and extends 14 to 18 feet underground. Crews doing sign installation work on SR 99 in Seattle completed their work ahead of schedule and all lanes are back open. 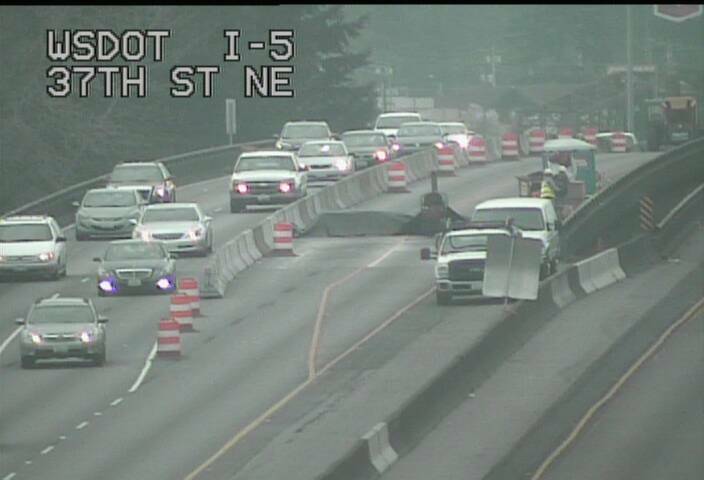 We're not free and clear of all lane closure just yet. While we've finished building the sign foundations, next on the docket is erecting the approximately 24-foot-tall, 7,000-pound metal sign structures (the actual signs will be hung at a later date). 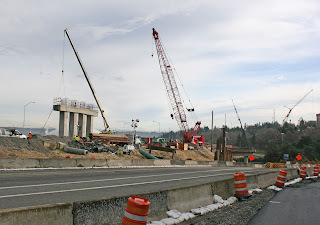 Raising the structures – three cantilevers and one sign bridge crossing over the southbound lanes – isn't an easy task, especially on a narrow highway like SR 99. Because of that, partial or full directional closures on SR 99 will be needed sometime this spring. Stay tuned for additional details once this work has been scheduled. Closing lanes on a busy stretch of highway is never easy. We recognize that work like this affects the daily routines of thousands of commuters, and we do our best to minimize disruptions. Thank you for your patience and flexibility as we completed this work, and thanks for doing your part to keep traffic moving over the past six weeks.